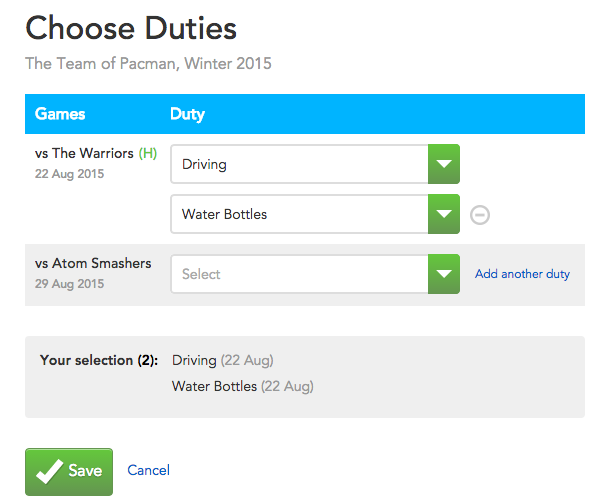 OK team members can signup for duties on the mobile apps ( probably the easiest ) as well as in the web. Here's the instructions for volunteering on the web site. Here they should find a large green button 'Choose Duties'. When you hit that button, the team member will be shown a grid of all the games in the season, and they can choose from those duties that remain. You can take multiple duties on the same game, or just spread that out amongst the season. In the example below, I've decided to take Driving and Water Bottles on the same game against the Warriors. Save - and those duties are now all yours. But note - you cannot 'unvolunteer' from a duty once you are assigned to it. Once assigned - its yours until the team manager changes it - or you successfully transfer the duty to someone else. so choose wisely please! Here's the end result of my choice - two duties on the one game.